Mints, Technology and Coin Production, Proceedings of the Round Table of the "Silver Monetary Depreciation and International Relations" program (ANR DAMIN, LabEx TransferS), Copenhagen, May 28-29. Georges Depeyrot, Michael Märcher, ed. 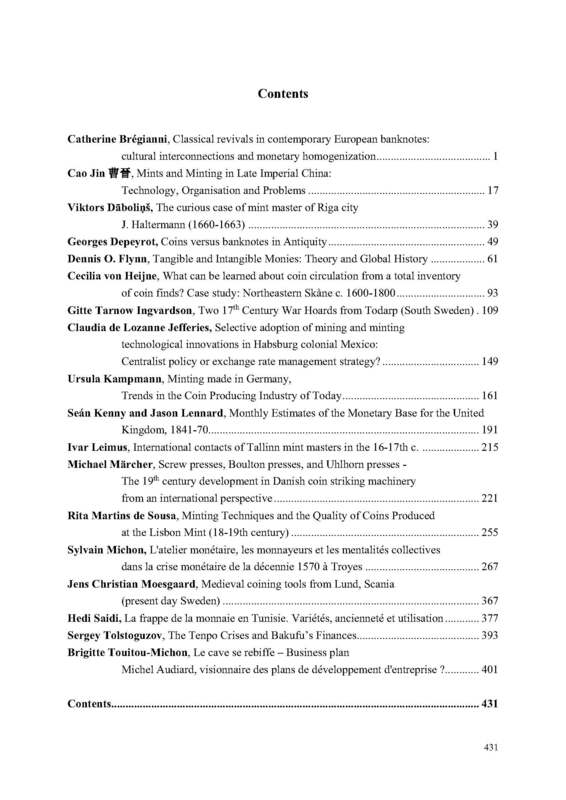 This volume is the proceedings of the Copenhagen meeting of the DAMIN program La Dépréciation de l'Argent Monétaire et les relations Internationales - Silver Monetary Depreciation and International Relations (www.anr-damin.net) with the participation of Katerina BREGIANNI (Athens), CAO Jin 曹晉 (Beijing), Viktors DABOLINS (Riga), Georges DEPEYROT (Paris), Dennis O. FLYNN (Stockton), Svein GULLBEKK (Oslo), Cecilia von HEIJNE (Stockholm), Gitte Tarnow INGVARDSON (Lund and Copenhagen), Claudia de LOZANNE JEFFERIES (London), Ursula KAMPMANN (Lörrach), Seán KENNY and Jason LENNARD (Lund), Ivar LEIMUS (Tallinn), Michael MÄRCHER (Copenhagen), Rita MARTINS DE SOUSA (Lisbon), Sylvain MICHON (Paris), Jens Christian MOESGAARD (Copenhagen), Hedi SAIDI (Lille), Sergey TOLSTOGUZOV (Hiroshima), Brigitte TOUITOU-MICHON (Paris).